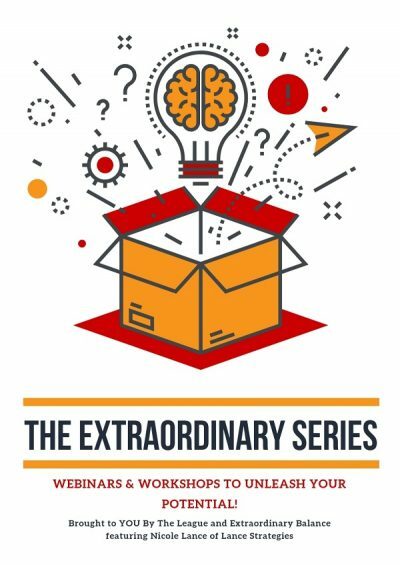 The League + Extraordinary Balance, featuring Nicole Lance of Lance Strategies, are excited to offer a three 1/2 day workshops entitled, The Extraordinary Series: Finding the Balance of Extraordinary Thinking, Extraordinary Speaking, and Being Extraordinary. FOR INFORMATION ABOUT THE EXTRAORDINARY WEBINAR SERIES, CLICK HERE. All workshops will be held from 1:00 PM to 5:00 PM at the City of Ventura City Hall, Community Meeting Room, 501 Poli Street, Ventura, CA 93002 and a networking reception directly after the workshop ends from 5:00 PM to 6:00 PM at a location TBD for all attendees. Parking is free in the lot behind City Hall. Despite our seemingly constant race to the bottom of the energy well, exhaustion and burnout are not status symbols. The world moves at an increasingly rapid pace, and we often don’t take time to meaningfully connect with ourselves or with others. We lose self-awareness, and it compromises our ability to be our most successful selves at work and at home. This half-day workshop takes you on an exploration of your own power to be extraordinary and provides large-scale frameworks for personal and professional success. You will learn micro strategies for self-care and dynamic tools to break through barriers so you can be more of what the world needs you to be. To register, scroll to the menu further down the page. $55-65 per workshop depending upon selection and eligible discount. NOTE: All free MMASC & SCE seats are SOLD OUT! Discounted rates still available for members of the League, Women Leading Government, NFBPA, LGHN and I-NAPA in pull down menu below. Through the generous sponsorship by Southern California Edison all registrations have been discounted! Through another generous sponsorship by Bob Murray & Associates, a mid-afternoon snack and beverage break will be provided to attendees. There will be a networking reception directly after each workshop at a location TBD. Make sure you plan to stay after the workshops to talk with the workshop presenters and meet colleagues from around Southern California. There are two things that get in the way of productive dialogue at work: our mouths and our brains. Based in psychology and the latest neuroscience research, this half-day workshop will equip you with tools for communicating with both candor and respect. You’ll learn how to be a stronger communicator, a deeper listener, and have courageous conversations with your coworkers. You will leave knowing how to build stronger relationships and increase your working efficacy. It IS possible to have Extraordinary Dialogue at Work! To register, scroll to the menu further down the page. Team dynamics can be tricky. Miscommunication, misperceptions, and mishaps in the ordinary course of doing business can undermine the critical foundation of trust needed for optimal performance. The problem is that just a mention of the term “Team Building” can seem like nails on a chalkboard. This is NOT team building. This half-day workshop blends tactical best practices with brain science to teach participants how to build trust faster, optimize team dynamics, and have team conversations that aren’t just basic communications – they’re Extraordinary Dialogue! To register, scroll to the menu further down the page. Thank you to our EXTRAORDINARY Sponsors!